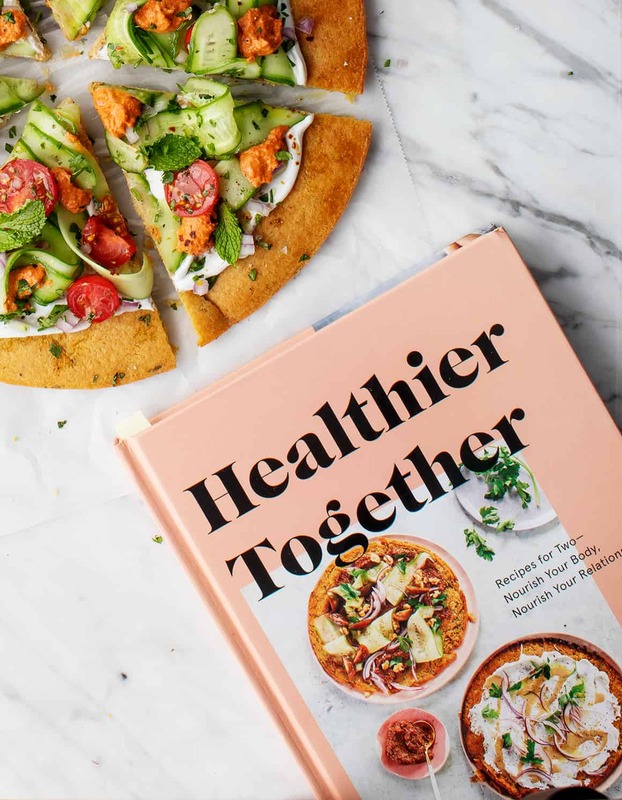 Today, I’m excited to share a book by my friend Liz Moody (you might know her as the food editor of Mind Body Green), but she also has a great blog, fantastic podcast, and this new book called Healthier Together. I think you’ll love it! 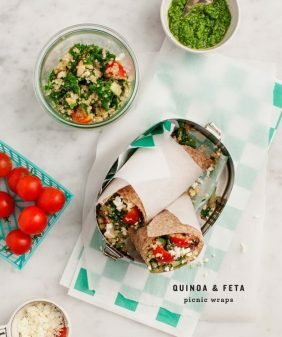 The concept of the book is that if you’re trying to eat healthier, you’re more likely to meet your health goals if you embark on your new lifestyle with another person, whether it’s your husband, mom, sister, friend, roommate, or coworker. Not only does cooking with a buddy keep you accountable, but it’s also efficient (you can divide up tasks, switch off cooking meals, etc. ), and, of course, it’s fun to bond with someone else in the kitchen while tasting tomato sauce. 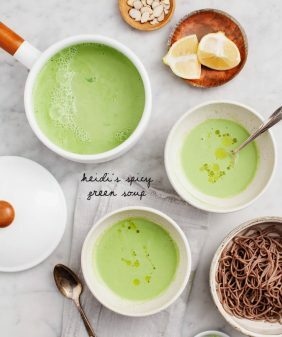 Each recipe in the book serves 2 people, and it’s organized by times you’d normally eat with another person – brunch, happy hour, date night, ordering take out, etc. 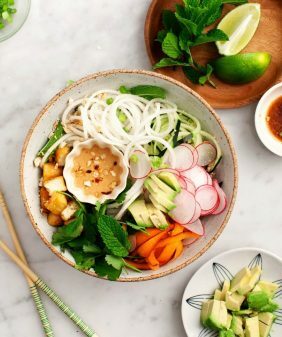 The recipes are all, of course, healthy versions of these types of foods. I had my eye on the Way More Veggies Bolognese and Zucchini Noodle Pad See Ew, but ultimately, I decided to cook the cover and make these falafel flatbreads. Yum!!! There’s not actually falafel in here – rather, the crust is made from chickpea flour (like socca) and is spiced with falafel seasonings such as cumin, coriander, chili powder, garlic, cilantro, and parsley. 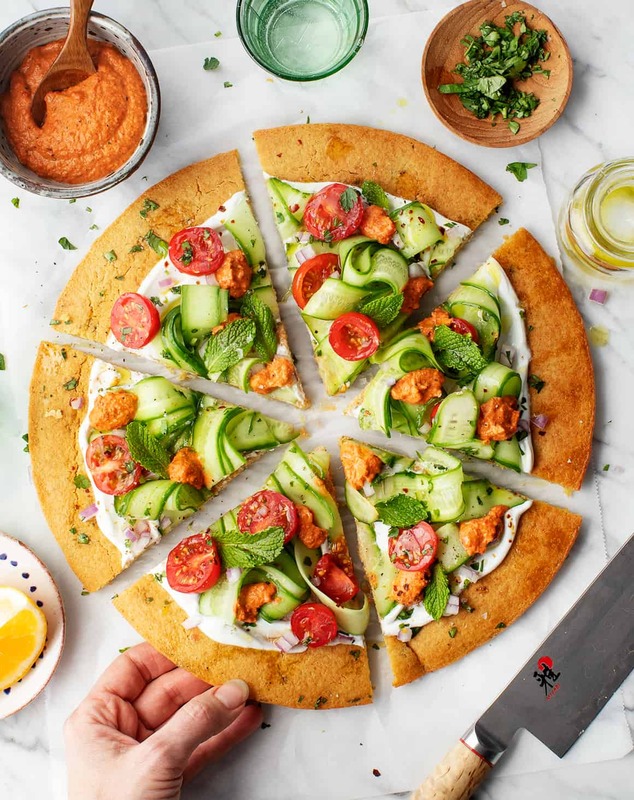 The flatbreads are topped with fresh Mediterranean toppings and dolloped with red pepper muhammara that I listed as optional below, but it’s really not optional because it’s so delicious! If you want to make this recipe with someone else, Liz suggests that one person make the flatbread and that the other make the muhammara. (To make this vegan, the muhammara can be used as the sauce base instead of the yogurt). These are so fresh and delicious – I hope you enjoy these flatbreads as much as we did! Adapted from Healthier Together, by Liz Moody. 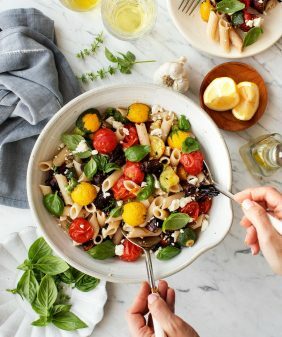 In a large bowl, whisk together the chickpea flour, salt, garlic, parsley, cilantro, cumin, coriander, chili powder, lemon juice, 2 cups water, and 6 tablespoons of the olive oil. Let the mixture soak for 30 to 60 minutes to hydrate the flour. Preheat the broiler with the rack in the center position. Place a 10-inch cast-iron skillet in the oven to heat up, about 5 minutes. Carefully remove the pan. Swirl in 1 tablespoon of oil to coat the bottom, then pour in half the batter. Tilt the pan until the batter is evenly spread. Return the pan to the oven and broil for 5 to 15 minutes, until the edges are brown and toasty (broilers tend to vary widely in heat/temperature from oven to oven). Remove the pan from the oven and gently slide the flatbread onto a plate. Repeat with the remaining batter to make a second flatbread. Smear the flatbreads with yogurt and top with desired toppings and dollops of the muhammara, if desired. Drizzle with olive oil and season generously with salt and pepper. 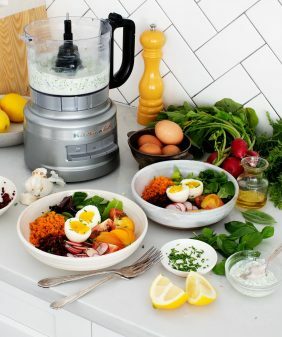 To a food processor, add the red peppers, walnuts, lemon juice, tomato paste, garlic, cumin, maple syrup, pepper flakes, and olive oil, and process into a smooth paste. Season to taste. Goodness that looks so good! and I LOVE your new cookbook! I was wondering if you had any thought on what you could replace the yogurt with , I just have never liked the taste of yogurt. Hi Susie – ooh, I’m so glad you’re loving the new book! The red pepper sauce in this recipe (that I dolloped on top)…. use that as the sauce base instead of the yogurt. It’ll be so delicious! This looks gorgeous! Just wondering if you could use fresh peppers that you roast and peel yourself (rather than jarred peppers) in the Muhammara recipe? Would you use four full peppers in that case? Hi Ingrid – you could! I would use one less since fresh red bell peppers tend to be larger than jarred ones. Also, you’ll need to add salt to the recipe -1/4 to 1/2 teaspoon. Amazing – thanks so much! Looking forward to trying it over the weekend. oh wow, what a great idea, love this, will definitely give it a try, thank you for sharing.